Mitsubishi Heavy Industries Ltd. (MHI) has established a specialized Oil & Gas Division within Houston-based Mitsubishi Heavy Industries America Inc. (MHIA). The division is intended to provide “one-stop” solutions for upstream, LNG and downstream markets. The new oil and gas division has opened offices in downtown Houston. 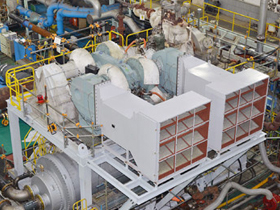 “I am convinced that the oil, gas and petrochemical industry in the U.S. will continue its robust development,” said Hiroaki Osaki, president of the newly-formed division and Mitsubishi Heavy Industries Compressor Corporation (MCO). “It is my responsibility to create synergies across MHI’s product lines and utilize our vast R&D network to seek out new technologies, innovations, and services that will drive value for customers and broaden the MHI Oil & Gas portfolio. MHI group has 7,300 employees across 30 states in the the U.S. It relocated its head office to Houston last year. Houston also houses the headquarters and factory of MCO’s U.S. subsidiary Mitsubishi Heavy Industries Compressor International Corporation (MCO-I) and a service base of the local subsidiary of Mitsubishi Hitachi Power Systems, Ltd. (MHPS).